This was the last talk on the Mass from the Life Teen "Word for Word" resource on the new translation of the Roman Missal. The focus of this talk isn't just the changes, but to use the changes to enter into the Mass more deeply, more intimately. Here's the slides with both presentation commentary and slide-layout commentary. "The Adoration of the Lamb". This is the heart of it all. The goal of this night is for the teens to understand the importance of the Mass, the divine liturgy, and to change the way they go to Mass by engaging in full, conscious, and active participation. Most of the fonts are in Helvetica, whether it be light, regular, or bold. In order to have the slides make more of an impact, I would eleminate spaces between words, but change their color, as you can see above. On several images, such as this one, I added the reflection at 70% opacity. Here I rounded out the corners, too. If you haven't read Dr Scott Hahn's Lamb's Supper, you are missing out. This is the key verse for that book, and for the Divine Liturgy. The image in the background, probably the most famous of Life Teen's wallpaper designs, is "send to back", with the saturation turned up, the sharpening turned down, and the contrast made darker. This way the priest's face in the background all but fades out, leaving a slightly blurred, radiating Eucharist as the focus. The words are Helvetica Light with the standard drop shadow behind it. The phrase "wedding day of the Lamb" is bolded and red for emphasis. Here we talked about the difference between the current and future translations of the Roman Missal into English. Formal equivalence seeks to keep it more word-for-word, whereas dynamic equivalence tries to give the sense of the passage without necessarily giving it word-for-word, which often descends into a mere paraphrase of the original. There is more interpretation involved in this type of translation than with formal equivalence. Full, conscious and active participation is the key to making Mass un-boring. Kids think Mass is religious entertainment, which is why they are bored with it. 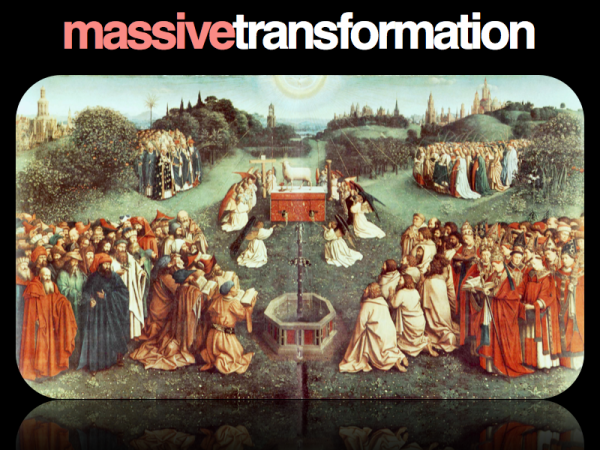 If we can transform their perspective on the Mass, then we transform their experience of it. We need to stop being spectators of the liturgy and start being participants! With the Helvetica font here I made it all caps and bold. I dropped the line spacing way down into the negatives until they lower words were just overlapping the higher words, and I adjusted the kerning so the letters were more crowded together, touching one another. The light blue color draws your eyes to the most important part, participating in the Mass, and the visual of the key hole tells us that the key to loving the Mass is through participating in it fully. Remember: everything about our faith is union with God in Christ Jesus. If we talk about the liturgy but leave out Jesus, leave out communion with Him in the Mass, then we might as well just stop talking and go home. The Mass is what identifies us as Catholics. We are one body because we partake of the one loaf. Every time we talk about liturgy, we need to connect it to intimacy with Jesus and growing in holiness. Jesus wants nothing more than a sincere gift of ourselves. Originally the image was going to be the whole size of the slide. I contemplated an arrow pointing to the present, saying "You Are Here" next to it, but I thought that was a little tacky. The scaling down of the image and pulling it off to the upper right-hand side allows the viewer to experience the giving of the present. By making it off-center it implies motion, like the gift is coming to you. The lowercase letters were meant to highlight the simplicity and humility of the gift, while the italics emphasized without mistake what that gift was. This slide is meant to bridge the gap between going to church and living our lives. We need to have a full, conscious and active commitment to Jesus Christ in and out of Sunday liturgy. The end of the presentation tied how we participate in the Mass to how we bring the liturgy into our lives. I kept the kerning dialed down sot that the letters just touched in the upper row, while incresing the kerning for "Commitment" to line up the characters. It just looked nice, while providing the appropriate emphasis on "Commitment". At this point the students have heard "Full, Conscious and Active Participation" about 15 times throughout the talk. Having "Commitment" up there with different formatting pulled the kids into the idea of committing themselves to life as they ought to do to Mass. Finally, even though we didn't get to this part, the night ends with a focus on bringing the needs of the parish to the minds of the teens. They are responsible for the conversion of the parish just as much as the adults are. "Prayers for Our Parish" develops another connection between liturgy, daily living, and our parish home that hopefully will remain with the teens. The image is of St Anthony of Padua where the Life Night was held. The picture is "send to back" and is heavily saturated. I also adjusted the reds and greens to make those colors stand out more. The green of the grass looks much more beautiful. The words in Helvetica follow the same line as the beginning of the reflection. The line spacing is turned down, as is the kerning here too.